Pagani's latest version of the Zonda,named the Cinque,is a street legal version of the race-only Zonda R and it will price at $1,240,000. Power comes from the same 7.3-liter V12,although it has been detuned to 678 horsepower,down from Zonda R's 750. The Cinque will also feature a full carbon fiber body,massive Brembo brakes,a six-speed sequential gearbox,and Pirelli PZero tires. Production will be limited to a mere five units,all of which have been spoken for. It is capable of accelerating from 0-62 mph in 3.4 secs and reaching a top speed of over 217. Value for this car will likely double in 10 years because only a few will be made. (from Pagani Press Release) The Pagani is not just a supercar manufacturer but rather a place where artistic objects take form following the renowned car tradition of Modena and the Renaissance concepts of art and science combined together by Leonardo Da Vinci over 500 years ago. In Pagani the carbon fiber is the specific know how and a perfect combination of technology and beauty. No compromises are accepted in the use of innovative materials,always the state of art,to express the passion and skill of who designed and built them. Back in 1999,launch year of the first Zonda,the Pagani has been focusing its strategies on the research of light weight. The chassis,completely made of composite and other light and innovative materials,contained the weight to 1250 kilos,when all the other cars of the same segment would weight from 30 to 50% more. 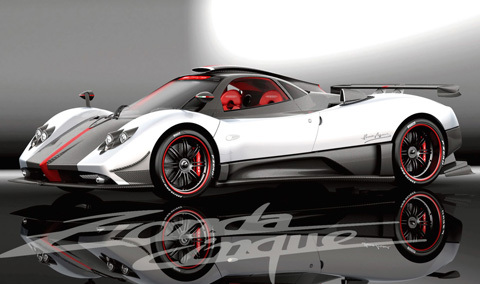 Despite of the light weight,the Zonda offered excellent comfort and safety standards. By chance,the impact on environment,as for example the fuel consumption,proved to be considerably lower than the traditional supercars and coupes of the same range,with weight from 1.800 kilos to 2.200 kilos.